Soumis par Patwhite.com le 27 décembre 2012 - 10:09. I visited a distant cousin to see what he might have in the way of family history. He had several portraits, one of which is labeled on the reverse H. D. Thielcke and dated 1856. The sitter is Sarah Walker Davis (1814-1879). 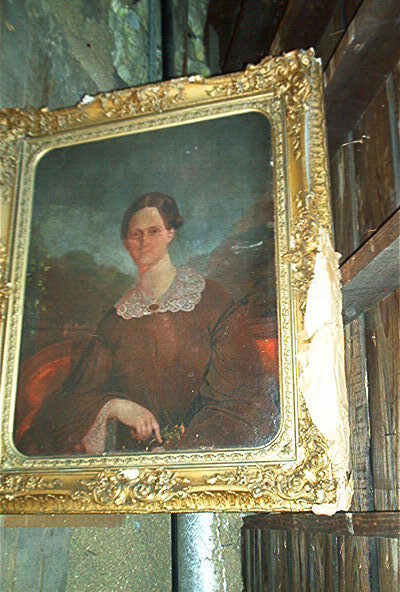 Even from this poor photo taken in an attic, you can see that the picture needs conservation. However, there are no tears nor too much paint loss, so the job shouldn't be impossible. Sarah Davis was the wife of David Davis (1815-1886). He was an Associate Supreme Court Justice appointed by his friend, Lincoln. The Davises lived in Illinois. Thielcke was painting portraits in Chicago in 1856. The sitter, Sarah Davis Walker (1814-79), is one of my ggg-grandmothers. Her husband, David Davis, was a US Supreme Court justice, appointed by Lincoln. I'm sure there is a wikipedia page, etc., on Davis, and for even more info, a Davis biography by Willard King exists. One of my Davis-line cousins owns the Thielcke portrait and he has lent it to the David Davis Mansion, a historic house in Bloomington, Illinois. The painting is being cleaned and repaired by a Chicago art conservation business, and will be on public view in spring 2013. The Scotch thistle Sarah holds in her right hand probably indicates her Scottish ancestry on her mother's side. Other symbols may be revealed by the cleaning. Thielcke had some trouble with the likeness, and he exaggerated her neck length, presumably in an attempt to add feminine grace. I don't know how or why Davis chose Thielcke to paint his wife's portrait. Davis's extensive correspondence is held by the Abraham Lincoln Presidential Library, however, I don't think Thielcke's name comes up in the finding aids. Davis had regular business in Chicago, where he owned an 80-acre tract in the south Loop.